Tiki Tong is the main antagonist and final boss of Donkey Kong Country Returns and Donkey Kong Country Returns 3D. He is also the boss of the Volcano area, residing in the massive Tiki Tong Tower. Tiki Tong is the leader of the Tiki Tak Tribe and the reason why the Tikis are running amok. He made his minions steal Donkey Kong's and Diddy Kong's Banana Hoard to make more Tikis. His level in the game is called Tiki Tong Terror, and the two music themes that play during the level are "Red Rockin' " and "Tiki Tong Song". Tiki Tong created his Tikis to help him take over Donkey Kong Island. He made the Tikis hypnotize the animals to help them steal the Banana Hoard, which is their life source. Tiki Tong had also set up a plant in the Factory, where Colonel Pluck and his robot Stompybot 3000 created more Tikis. However, Tiki Tong's plans were stopped short by Donkey and Diddy. When Donkey Kong and Diddy Kong invade Tiki Tong's lair, all of the boss Tikis come and throw the remaining bananas in Tiki Tong's head. It then turns the bananas into juice by spinning around, and then spitting it on the Tikis. This action transforms its minions into hands so that he can take care of the two once and for all. Tiki Tong's death launches the Kongs into space. While there, Donkey and Diddy knock the moon down to earth, which crushes the Tiki base inside the volcano. This releases the bananas, which sends them and the moon flying out of the volcano. With the statue destroyed, the effects of the hypnosis on the creatures of the island are undone. Donkey and Diddy are able to land before they crash onto the island, and cheer as their bananas continue to rain from the volcano. Tiki Tong appears as a Donkey Kong series trophy in Super Smash Bros. for Wii U. It is unlocked by purchasing it from the trophy shop. Donkey Kong and Diddy Kong get set to fight Tiki Tong. Tiki Tong is a large, wooden head that bears a resemblance to a drum. He has sharp, wooden teeth with orange and purple stripes located below them. He has a flat nose and two, huge, spherical, and uneven eyes. One of the eyes has the same orange and purple stripes with pointed eyelids while the other is bare with normal eyelids. His sclera are black and his pupils are red. Tiki Tong has red markings around his eyes and has red leaves where its “ears” are. He wears a wooden crown with the outer ring being purple with orange triangular markings on the front. He also has two hands with orange fingers and purple zig-zags on the backside. When Tiki Tong has both hands, he generally performs three attacks. His first attack is to lay his hands flat in the air and quickly sweep them across the stage. This can be avoided by simply ducking. During this attack, the palms of his hands can face up or down. If the hands face up, a Heart may appear on one of them. Even if there is a heart, the Kongs should not attempt to jump on the hands. If they do, Tiki Tong will close his hands, squishing Donkey Kong and Diddy Kong. If the hands face down, however, jumping on them will cause damage to Tiki Tong. Tiki Tong will also slam his hands on the floor. Sometimes, he quickly removes his hands, but other times, he leaves them there for a longer period of time, leaving an opportunity to deal damage to the exposed back of the hand. Tiki Tong may also only attack with one hand, instead of both. Tiki Tong may also move his hands to both sides of the stage, and then quickly clap them together. If Donkey Kong and Diddy Kong are caught in the middle, they will take damage. This can be avoided by jumping over either hand before Tiki Tong moves them. When he only has one hand, he does the same attacks, except much faster. He can also fake out a hand slam. 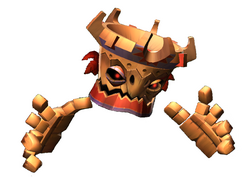 When Tiki Tong loses both his hands, he attacks by slamming his head into the ground, causing shockwaves. This will reveal his weakness: the button on his head. When it is damaged once, he can swoop his head down, which can be dodged by ducking. He can also send out four Flaming Tiki Buzzes that will chase the Kongs. When it is damaged once more, he can rain down Flaming Tiki Buzzes. Tiki Tong's mode of combat makes him a hands and head boss. During Tiki Tong’s first phase, Donkey Kong must step on the red button on the boss's hands when it slams them on the stage. After each hand is damaged twice, they will fall apart into bananas. During the second phase, the simians must jump on the red button on top of Tiki Tong's head to cause it damage. After Tiki Tong is damaged three more times, he explodes into bananas, destroying the remaining Tikis and lifting the curse put upon the animals. Tiki Tong Tower is subsequently destroyed when Donkey Kong punches the Moon onto it. Unlike all the other boss fights, the Tiki Tak Tribe members do not spectate during the Tiki Tong battle. Tiki Tong, along with the nine Tiki leaders. Phase 1 of the battle. Tiki Tong's hand sweep attack. Tiki Tong slams his hands onto the ground. Tiki Tong claps his hands together. Tiki Tong loses one of his hands. Phase 2 of the battle. Tiki Tong exposes his weak spot. Tiki Tong releases a bunch of Flaming Tiki Buzzes. Tiki Tong dives down in attempt to ram into the Kongs. Tiki Tong's silhouette for when the Kongs lose a life at the Volcano world. If Donkey Kong loses a life after encountering Tiki Tong, regardless of whether or not he wins, the "Question Mark" icon changes to a silhouette of Tiki Tong's head. Tiki Tong's fight music is one out of the three boss themes that can be unlocked, the others being Stu's and Mangoruby's. Similar to King K. Rool, one of Tiki Tong's eyes is bigger than the other. As seen in the image gallery, Tiki Tong was originally going to have four fingers on each hand. If the player is using the "only Diddy Kong" mode, after beating the boss, Diddy Kong will be sent into space, but unlike with Donkey Kong, he will panic, and desperately try to save himself from crashing into the moon, by using his barrel jet. It malfunctions however, and Diddy is sent banging his head on the moon, making it fall onto the volcano like usual. But then he falls down to the ground unconscious, but Donkey catches him in his arms, and they meet up on the ground, and rejoice about getting their bananas back. This page was last edited on February 7, 2019, at 01:21.